Uniqueness nowadays seems to come more and more in the form of being the same as everyone else. Zlatan Ibrahimović, the self-proclaimed best footballer in the world and a very "unique" individual is really not much more than a conformist with a little anger issues and lack of manners. Nonetheless, the Swede tries to show off his individuality not only through his actions but through his impressive collection of tattoos, the newest of which includes 50 names of starving people from around the world being helped by the United Nations World Food Programme. 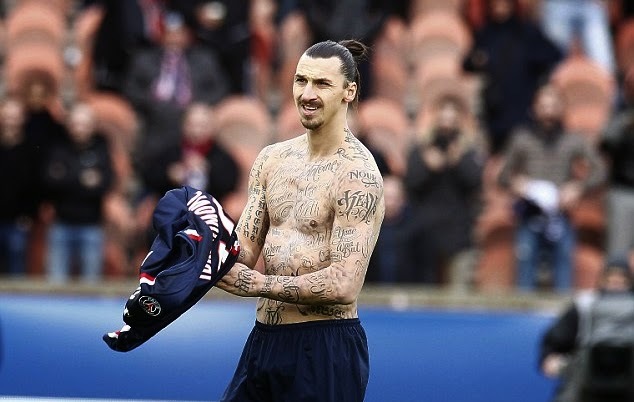 And although the new one is perhaps a bit more interesting than others, we give you Zlatan's 5 most generic tattoos. #5 - The "Only God Can Judge Me"
Apparently Tupac was a huge influence on the young bike thief from Malmö. 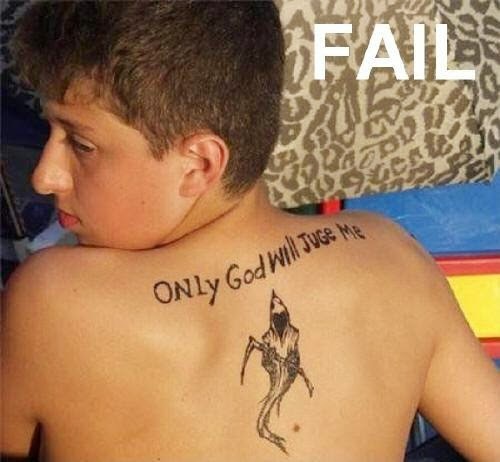 The words from the song can be found tattooed on many worldwide, but perhaps he should be happy that he didn't make the same mistake as this poor lad below. 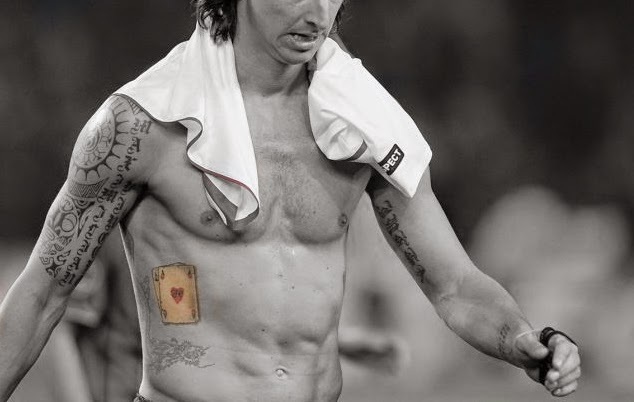 Pocket-rockets are known as the best hand in poker and surely Zlatan's intention with this tat was nothing more than to describe himself or something about his life as top of the line. Perhaps even his partner Helena as it seems that there is a letter H in the card. If I had as many aces in my poker games as I have seen this tattooed on people, I'd probably be winning yet another WPT tournament as we speak. I literally know two poeple who don't know one another who have had the exact same dragon tattoo permanently put on their body by different tattoo artists. Lesson: unless you're Japanese or perhaps your mother looks like one there's a good chance you have nothing to do with a Japanese Dragon so why is everyone getting this done? Nothing says douchebag like your own name tattoed on yourself. But Zlatan has outsmarted the world once more because his name is tattooed in white ink, which means 9 out of 10 people will not realize he's a douche until he opens his mouth. 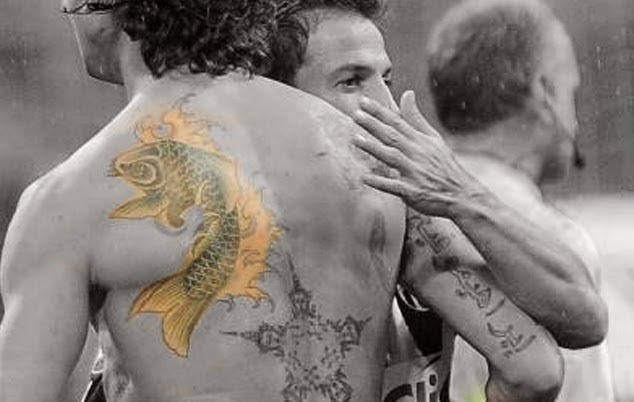 Another Japanese design that has become one of the most popular tattooed subjects in the world, the koi actually has various meanings and surely Zlatan has looked into all of them before choosing this particular design from the flip posters in the shop. 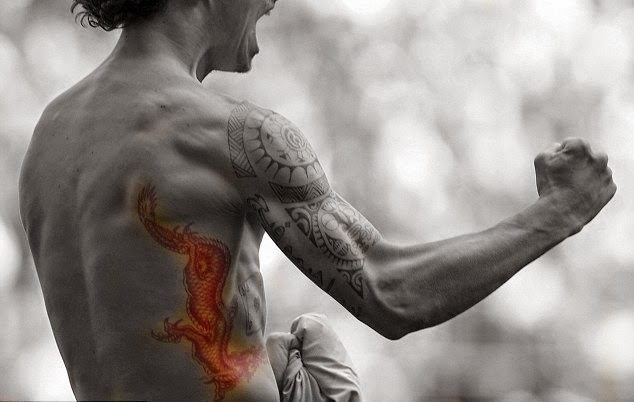 Perhaps the most appropriate meaning for Zlatan's piece is that a if a koi fish successfuly climbs the falls at a place called the Dragon Gate the fish turns into a Dragon...wait a second...couldn't he just get two dragons instead?